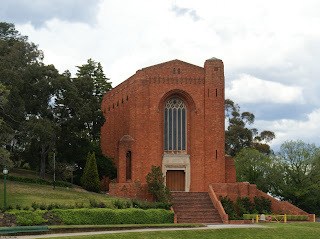 This is the Littlejohn Memorial Chapel at Scotch College, Melbourne. Love at first sight. (Online, that is. I've never been there in real life.) The building was completed in 1937, but I've not been able to find out who the architect was. Picture from Wikipedia. The architects were Scarborough, Robertson and Love. They designed a whole group of buildings in the 1930s at this private school (Scotch College).